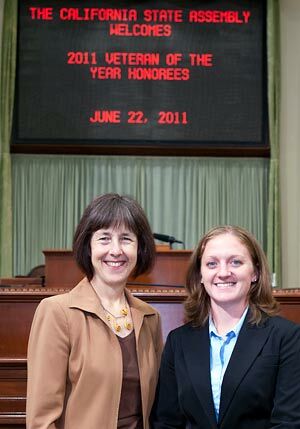 Mia Geurts, a recent UC Berkeley graduate, was honored Wednesday at a Capitol luncheon ceremony as the 14th Assembly District’s Veteran of the Year. The award, presented by Berkeley Assemblymember Nancy Skinner, recognizes Geurts’ military service as well as her humanitarian volunteer efforts. Geurts, an East Bay native, served in the Army for four years before returning for college. She was an Army combat medic in Iraq, earning a combat medical badge and an expert field medical badge in recognition of her medical work under fire. Since returning from active duty, she has remained involved in the medical field, volunteering at Livermore Veterans Hospital and as part of a UC Berkeley student organization, Volunteers for Medical Outreach, or VMO. Geurts is also a member of the Cal Veterans Group. As a VMO participant, Geurts has traveled twice to Vietnam, providing basic medical care and preventative services in rural communities that lack access to health care. Through mobile clinics, she was able to assist in reaching up to 1,000 people each day with general health and dental services, hepatitis B vaccines and sponsorship of corrective surgeries. Geurts attended Diablo Valley College before transferring to Berkeley, where she graduated in May with a degree in molecular and cell biology. She plans to go to medical school and then return to the Army as a doctor. She also remains committed to her volunteer efforts, both here and in Vietnam.